Welcome to our Wheaton Franciscan Campus. Central to the campus is the Our Lady of the Angels Motherhouse, which serves as the headquarters for the United States province of the Franciscan Sisters, Daughters of the Sacred Hearts of Jesus and Mary, more commonly known as the Wheaton Franciscans. In addition to serving as the offices for Province leadership and staff, Our Lady of the Angels Motherhouse is home for a group of our Sisters and is the communal gathering place for Province meetings and celebrations. Our Lady of the Angels includes the Wheaton Franciscan Library, a rich resource of books and magazines to inspire and inform. Our Lady of the Angels also provides administrative office space for the United States Province of the Institute of the Blessed Virgin Mary (IBVM) sisters. Our beautiful Chapel was originally built in 1954 and renovated in 1990 to meet current worship standards and the needs of the Wheaton Franciscan community. Three original treasures of the chapel were maintained and highlighted – the stained-glass windows designed by Francis Deck of the Emil Frei Studios, St. Louis Missouri; the stations of the cross, set into the wall under the windows and framed with Botticino marble; and the large cross, of Negor Marquino and Bianco Carra marble suspended from the original altar. Our Chapel is open during regular hours of operation. Learn more about scheduled liturgical services here. 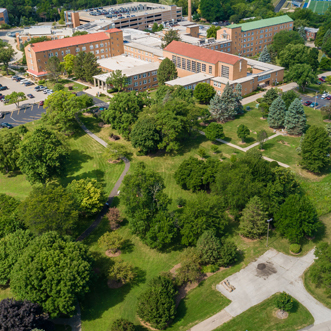 Our 60-acre campus is also home to Marianjoy Rehabilitation Hospital now part of Northwestern Medicine, IBVM Loretto Sisters, and to Canticle Place, a 12-unit apartment complex providing affordable housing to persons living with AIDS. Winding through the grounds is our paved Peace Path. 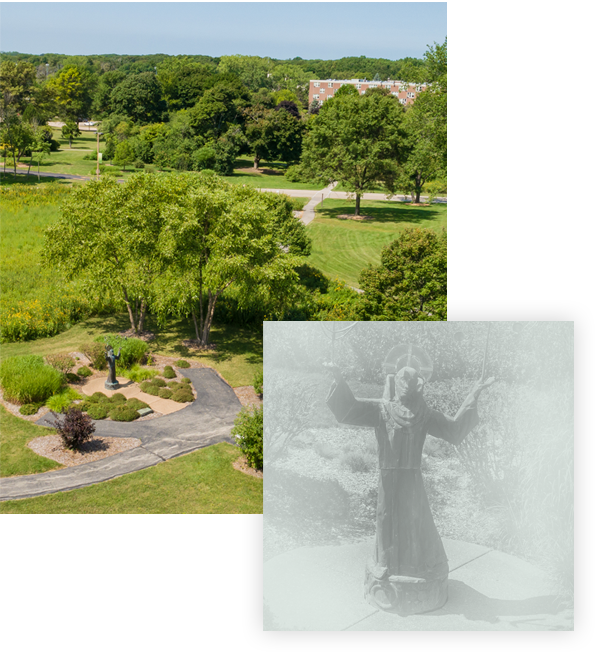 The Peace Path will take you around and through several acres of beautiful prairie planted with native Illinois grasses; small woodlands, a butterfly garden and the Cosmic Walk featuring watercolor images of Significant Moments of the Unfolding of the Universe by Sr. Corlita Bonnarens, RSM. Mon-Th: 8:00 a.am. 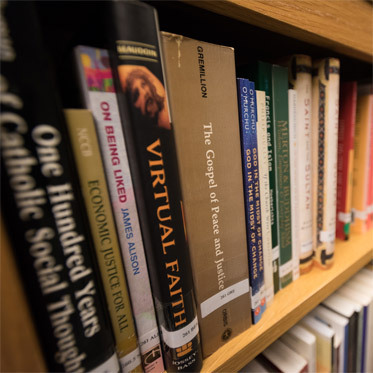 to 7:30 p.m.
Our Library is available for those seeking resources on the Franciscan way of life, spirituality, justice and peace, health and wellness, and many other topics for the body, mind and soul. We ask all first-time users to complete a Library Access Form found on the table in the library. This information is added to our Library Database system and allows us to track due dates and send reminder notices. We ask ALL users to sign book(s) out. This is our “check-out” process. The sign-out form is also on the table in the library. Please complete all the requested information. Books may be checked out for one month with the potential of an additional renewal period upon request. This time limitation allows us to better serve our library users. Our library is a shared resource. We ask for your support in following these guidelines. Enjoy a peaceful walk on our campus along a winding path through beautiful prairie of native Illinois grasses and small woodlands. Our peace path is a beautiful space for a walking meditation, allowing for both spiritual reflection and physical exercise. The mile-long path is paved and wheelchair accessible with many intersections which allow you to circle through the prairie for shorter or longer exploration. Along the path you will find many spaces to sit in prayer or contemplation, including benches, seats carved from natural elements, or small grassy areas to spread out a blanket. As you go you can enjoy sculptures, statues and other points of reflection. Stop at one of the Prayer Bells along the path, where you can take a moment of intention and ring the bell. As the sound of the bell echoes forth – so do your prayers reverberate and your intentions are felt for the world. The Peace Path was created by the Wheaton Franciscans as a part of our healing ministry. Plantings of many varieties of trees, shrubs and flowers add a quality of beauty, calm and peace. A butterfly garden and Cosmic Walk have been added to the Peace Path.